If you are looking for a dental practice that caters to special care patients, you can turn to Dr. David Kurtzman in Marietta. Dr. Kurtzman is a highly skilled and experienced dentist who has uniquely structured his practice to provide top quality, personalized care for patients who have dental fear or anxiety as well as those that have medical disabilities including developmental and physical disabilities. You will find that our entire staff values a compassionate and holistic approach as we meet your oral health needs. Dr. Kurtzman welcomes patients of all ages who need specialized dental care. We are known for our willingness and success in treating hard-to-treat clients. 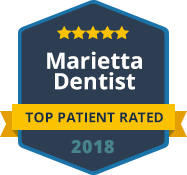 Our Marietta office offers special care patients a warm, relaxing environment and we also provide sedation dentistry to help them through their dental appointments. Our patients love our committed adherence to scheduling appointments far enough apart that we are able to spend quality time with each one. Dr. Kurtzman is a reputable Special Care Patients Dentist who offers comprehensive dental services, including cosmetic, restorative and preventive dentistry. We make sure our patients are fully at ease before any dental work is performed. Contact us today to schedule an appointment with a dentist who prides himself on doing dentistry differently. We do everything we can to deliver our dental services with unhurried and compassion care, making your experience as positive as possible.